BALTIMORE, Md. — Reece Early is a flamethrower. His fastball hits 90 miles per hour. How? Determination, training and hard work. “Times that I wanted to take a break I told myself I got to go out there and keep working hard,” he said. 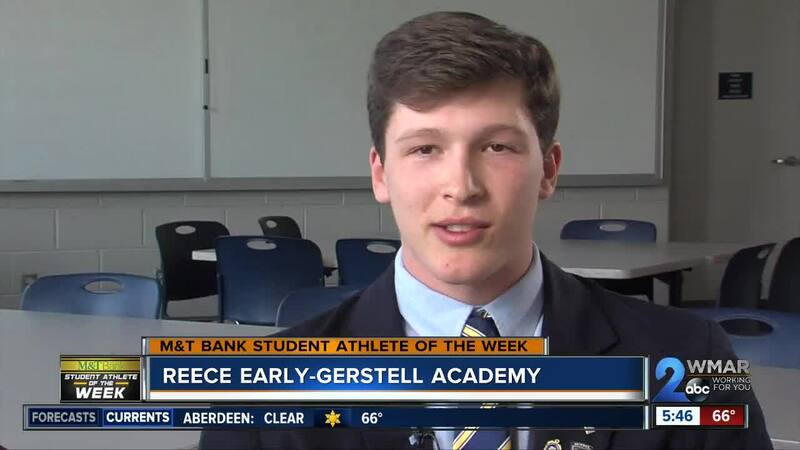 Early is the ace pitcher of the Gerstell baseball team. He is preseason all-state and played on the U.S. Elite National under-18 team. “I just love the sport,” he said. “We know every single time that we go on the field, when he's on the mound, that we've got a chance to win. It doesn't matter who we're playing,” said Gerstell Head Baseball Coach Cap Poklemba. Other than baseball, he's played some basketball for the Falcons. For his senior year he took up soccer for the first time. “I heard they needed a goalie, and I thought why not just give it a shot. It was okay. It was a lot of fun,” laughed Early. But there's no question about it: his future is on the diamond. “He's been a leader for us for four years. We were a growing program, and he kind of set the standard for what we needed and what we wanted to be,” said Poklemba. That next level now is playing ball next year at the Naval Academy. Congratulations Reece Early. You're this week's M&T Bank Student Athlete of the Week.